Levetiracetam (LEV) has proved to be effective in the treatment of many epileptic conditions, also affecting children and adolescents, and well tolerated in most cases. ,,,, In the literature, a few, usually short-term studies exist on LEV cognitive and behavioral effects in childhood epilepsy that use standardized tests. In a 2009 randomized, double-blind, placebo-controlled study that lasted 12-weeks, Levisohn et al. did not find any different neurocognitive effects in children and adolescents with partial seizures who were treated with adjunctive LEV (46 cases) or placebo (27 cases) respectively. For that same sample, during the same 12-week period, de la Loge et al. evaluated the behavioral and emotional functioning, and found increased aggressive behaviors in the patients who had been treated with LEV in comparison with those treated with placebo. More recently, in a 48-week open-label extension study on the effects of adjunctive LEV in a group of 103 children with partial epilepsy, Schiemann-Delgado et al. found a stable cognitive functioning, as well as emotional and behavioral improvements. However, till now, literature data on the long-term effects of LEV in childhood epilepsy, based on extensive neuropsychological evaluations using standardized tests, are still scanty. The aim of our study was to assess, by means of objective tools, the cognitive and behavioral long-term consequences of adjunctive LEV treatment in a sample of children and adolescents with epilepsy, in relation to seizure and electroencephalogram (EEG) outcome. This was an open-label study, observational and perspective, lasting 12 months, approved by the local Ethics Committee. An informed consent was obtained from the parents of the subjects. We included in the study patients affected by epilepsy with focal or generalized seizures, who came to our clinic for diagnosis and treatment from February 2006 to December 2008. We considered the following inclusion criteria: Age between 6 and 16 years; full intelligence quotient (FIQ), detected by standardized instruments (see below), over 50; a therapy constituted by only one AED, at adequate therapeutic levels, at the moment of the observation. We excluded: Patients with severe psychiatric, motor, visual, auditory disorders, progressive neurological pathologies, and liver or renal diseases; patients who assumed psychotropic drugs; and pregnant or sexually active, but not using adequate contraception, adolescent girls. The starting dosage of LEV, 10 mg/kg/day, was titrated up to 30 mg/kg/day over a period of 4-weeks; in some cases, seizure and EEG outcome would determine further increases (10 mg/kg/day/week), up to a maximum dosage of 60 mg/kg/day. The study, which lasted 12 months, was divided into five stages, identified as T 0 , T 1 , T 2 , T 3 and T 4 , with T 0 ("baseline") referring to the time before starting the LEV treatment and the others corresponding to 3, 6, 9, 12 months respectively. [Table 1] shows the study design, with the various clinical, instrumental and neuropsychological tests performed at each step. Reasons for the patients to drop out of the study included: Significant side effects; significant alterations of biochemical tests; poor compliance; violation of study design; lack of improvement in seizure control and/or EEG results after at least 6 months of adequate therapy. In each stage of the study, we performed a neurological examination and investigated possible AED side effects, school learning and behavior. Further, we evaluated seizure semiology and monthly frequency (mean number of seizures in a month) using the following five-point scale (from maximum improvement to maximum worsening): (a) Decreased frequency of ≥50% respect to T 0 (baseline); (b) decreased of <50%; (c) unchanged; (d) increased of <50%; (e) increased of ≥50%. We performed EEG recordings during wakefulness and sleep at T 0, T 2 , T 4 , and only during wakefulness at T 1 and T 3 . To evaluate the EEG we considered the frequency of paroxysmal abnormalities (PA), that is, the mean number of spikes or spike-waves in a minute, using the following five-point scale (from maximum improvement to maximum worsening): (a) Decreased of ≥50% respect to T 0 (baseline); (b) decreased of <50%; (c) unchanged; (d) increased of <50%; (e) increased of ≥50%. At T 1 and at T 3 the comparison with T 0 considered only EEG recording during wakefulness. We performed the plasma assay of the AED and a biochemical test screening (complete blood count with formula, liver and renal function) at T 0, T 2 , and T 4 . Wechsler intelligence scale for children-Revised results were expressed as standard scores; digit span results as scaled scores; and the outcome of all the other cognitive tests as Z-scores. We considered "poor" all performances corresponding to a Z-score of <−2. SDQ results were expressed as raw scores. We compared the results at T 0 with the results at T 1 , T 2 , T 3 and T 4 using the randomization test for the cognitive tasks and the Wilcoxon Sign Rank Test for SDQ. Then, we used the Spearman's Rank Correlation Test in order to assess the relationship between the significant cognitive or behavioral variables and the seizure and EEG outcome. We considered statistically significant a P < 0.05. 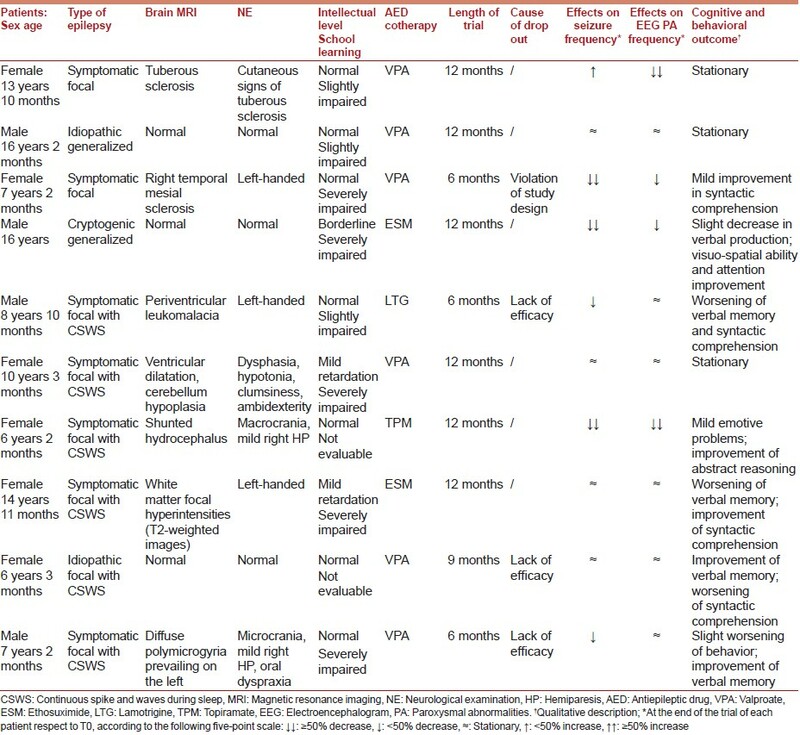 General data about the sampled patients and the effects of LEV are reported in [Table 2]. Ten patients (four males, six females) were included in the study; the mean age was 10 years 8 months (range: 6 years 2 months-16 years 2 months). Eight were affected by epilepsy with focal seizures, in seven cases symptomatic and in one case idiopathic. Two patients were affected by epilepsy with generalized seizures, in one subject idiopathic (juvenile myoclonic epilepsy) and in the other cryptogenic. In six cases with focal seizures, the EEG showed continuous spike and waves during sleep (CSWS), with a mean number of spikes or spike-waves in a minute over 60 during slow sleep. Intellectual level was normal in 7/10 cases and borderline in 1/10; a mild retardation was present in 2/10. 8/10 cases presented a variable impairment of school learning, which could not be assessed in 2/10 due to the patients' young age. When the study began, six patients were already undergoing a stable monotherapy with valproic acid; two patients were being treated with ethosuximide (ESM), one with lamotrigine, and one with topiramate. All 10 cases were evaluated at least until T 2 . Six patients reached the last phase at 12 months (T 4 ). Four patients dropped out of the study early on (three at T 2 , one at T 3 , respectively) due to the lack of LEV effectiveness on seizure frequency and/or EEG PA (3 cases), or failure to comply with the study design (1 case). Compared with T 0 , we observed a decrease in seizure frequency of ≥50% in 3/10 patients at T 1 , in 3/10 at T 2 , in 2/7 at T 3 , and in 2/6 at T 4 . About the EEG, compared with T 0 , we observed a decrease in PA frequency of ≥50% in 2/10 patients at T 1 , in 2/10 at T 2 , in 2/7 at T 3 , and in 2/6 at T 4 . Considering the different length of the trial in each patient (12 months for 6 cases; 9 months for one; 6 months for three), at the end of the study for each case we observed a ≥50% decrease in seizure frequency in 3/10 cases and in EEG PA frequency in 2/10 cases. Concerning in particular the 6 cases with CSWS, LEV treatment proved to be effective in fragmenting EEG PA during sleep in one of them at the end of the study (T 4 ) [Table 2]. Mild side effects have been detected in 5/10 patients (irritability in three; drowsiness in two). No pathological alterations of biochemical tests have been detected. Plasmatic levels of AED were within the therapeutic range in all cases except one, in which ESM at T 2 decreased slightly, and its dosage was, therefore, increased. In general, no significant worsening of all cognitive performances has been detected between T 0 and the other four stages of the study. More specifically, no significant differences have been found regarding FIQ, VIQ, PIQ, syntactical verbal comprehension, verbal fluency, visual-constructive and visual-motor skills, alertness, attention, verbal and not verbal working memory. As regards the abstract reasoning (Raven progressive matrices), we found a significant improvement from T 0 at both T 2 (P < 0.05) and T 4 (P < 0.05) [Table 3]. Regarding the SDQ results, all the comparisons at T 1 , T 2 , T 3 and T 4 with T 0 were not significant [Table 4]. In considering two significant variables (abstract reasoning at T 2 and T 4 ), we searched a correlation with seizure and with EEG outcome respectively using the Spearman's Test, but the results were not significant. Today, the attention of researchers studying the effects of AEDs is still focused primarily on the seizures outcome. This is understandable, but, especially in childhood epilepsy, cognitive and behavioral impairment could have a high impact on a child's quality of life, sometimes even higher than the seizures themselves; hence the need to limit the AED side effects as much as possible. In order to achieve this goal, the use of standardized neuropsychological tests in the evaluation of AED effects is strongly recommended. In fact, spontaneous reports regarding adverse or favorable effects can give an unreliable picture of the situation, suggesting distorted or incomplete conclusions. Ours is one of the very few studies that aim at evaluating the long-term cognitive and behavioral effects of LEV in children, by assessing prospectively and systematically various neuropsychological functions using standardized and objective tools. In our series, at the end of each patient's trial, LEV was very effective on seizure frequency in 3/10 cases and on EEG PA frequency in 2/10 cases. These percentages are relatively low if compared to those presented in other studies, ,, but one must consider that our patients were highly selective with high recurrence of cognitive problems, symptomatic epilepsy, and CSWS, all factors that can contribute to worsening the prognosis. About our 6 cases with CSWS, only one had a marked EEG as well as clinical improvement (particularly in abstract reasoning). Our data suggest that in developmental age an adjunctive AED LEV is well tolerated and does not involve an enhanced risk of negative cognitive and behavioral effects, also in a long-term follow-up. In fact, a favorable effect on abstract reasoning could also be hypothesized, regardless of LEV's efficacy on seizures and EEG. It would be advisable, however, to verify these findings on a numerically larger series. 1. American Academy of Pediatrics Committee on Drugs. Behavioral and cognitive effects of anticonvulsant therapy. Pediatrics 1995;96:538-40. 2. Vinayan KP. Epilepsy, antiepileptic drugs and educational problems. Indian Pediatr 2006;43:786-94. 3. Høie B, Sommerfelt K, Waaler PE, Alsaker FD, Skeidsvoll H, Mykletun A. The combined burden of cognitive, executive function, and psychosocial problems in children with epilepsy: A population-based study. Dev Med Child Neurol 2008;50:530-6. 4. Lagae L. Cognitive side effects of anti-epileptic drugs. The relevance in childhood epilepsy. Seizure 2006;15:235-41. 5. Parmeggiani A, Giovanardi-Rossi P. I farmaci antiepilettici: Effetti cognitivi e psichiatrici [Antiepileptic drugs: Cognitive and psychiatric effects]. Gior Neuropsich Età Evol 2002;22:55-63. 6. Aeby A, Poznanski N, Verheulpen D, Wetzburger C, Van Bogaert P. Levetiracetam efficacy in epileptic syndromes with continuous spikes and waves during slow sleep: Experience in 12 cases. Epilepsia 2005;46:1937-42. 7. Glauser TA, Ayala R, Elterman RD, Mitchell WG, Van Orman CB, Gauer LJ, et al. Double-blind placebo-controlled trial of adjunctive levetiracetam in pediatric partial seizures. Neurology 2006;66:1654-60. 8. Wheless JW. Levetiracetam in the treatment of childhood epilepsy. Neuropsychiatr Dis Treat 2007;3:409-21. 9. Lee YJ, Kang HC, Kim HD, Lee JS. Efficacy and safety of adjunctive levetiracetam therapy in pediatric intractable epilepsy. Pediatr Neurol 2010;42:86-92. 10. Harbord MG. Levetiracetam in children and adolescents with epilepsy and hemiplegic cerebral palsy. J Paediatr Child Health 2011;47:302-4. 11. Levisohn PM, Mintz M, Hunter SJ, Yang H, Jones J, N01103 Levetiracetam Study Group. Neurocognitive effects of adjunctive levetiracetam in children with partial-onset seizures: A randomized, double-blind, placebo-controlled, noninferiority trial. Epilepsia 2009;50:2377-89. 12. de la Loge C, Hunter SJ, Schiemann J, Yang H. Assessment of behavioral and emotional functioning using standardized instruments in children and adolescents with partial-onset seizures treated with adjunctive levetiracetam in a randomized, placebo-controlled trial. Epilepsy Behav 2010;18:291-8. 13. Schiemann-Delgado J, Yang H, de la Loge C, Stalvey TJ, Jones J, Legoff D, et al. A long-term open-label extension study assessing cognition and behavior, tolerability, safety, and efficacy of adjunctive levetiracetam in children aged 4 to 16 years with partial-onset seizures. J Child Neurol 2012;27:80-9. 14. Riva D, Nichelli F, Devoti M. Developmental aspects of verbal fluency and confrontation naming in children. Brain Lang 2000;71:267-84. 15. Alpherts WC, Aldenkamp AP. 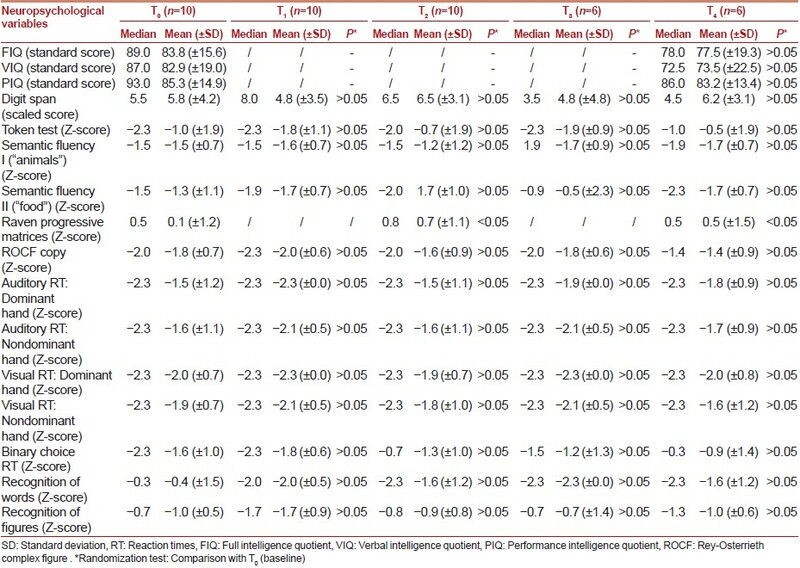 Computerized neuropsychological assessment of cognitive functioning in children with epilepsy. Epilepsia 1990;31 Suppl 4:S35-40. 16. Goodman R. The strengths and difficulties questionnaire: A research note. J Child Psychol Psychiatry 1997;38:581-6. 17. Klitgaard H, Pitkänen A. Antiepileptogenesis, neuroprotection, and disease modification in the treatment of epilepsy: Focus on levetiracetam. Epileptic Disord 2003;5 Suppl 1:S9-16.